The $6,000 Hardee's Combo Meal offered exclusively at the Palms Casino Resort in Las Vegas has garnered a lot of attention. The Hardee's commercial features the Maloof Brothers, who own the casino, chomping a good looking burger with a better looking female server pouring the best of wines. Something of a higher scale version of Miles drinking his 1961 Cheval Blanc out of a cup at the fast food joint in the movie Sideways. Now while your winemonkey was interested in both the burger and the server, our vino girl reined me in so that we could concentrate on the wine. What you can't tell from the ad (and we tried- it was clearly a prop or a different bottle) is that the wine being offered as a part of the Palms deal is actually the 1982 Chateau Petrus, a fine wine indeed. That being said, both vino girl and I have issues with a lot of this offer (none of it hamburger related) so we'd like to lay it out. 1. You are getting ripped off. Okay this is Vegas and when you have to bling it-- you bling it, but those frugal minded fast food consumers who are reading this should be aware that the 1982 Petrus is available to you at retail for about $3,500 leaving you with a lot of left over hamburger money. Even for a restaurant that is a lot of mark up. Oddly, famed wine restaurant Bern's Steak House has it for $2,200 a relative bargain even over retail. 2. You are drinking it too young. Your burger will be ice cold long before this bottle is ready to drink. The '82s we've been tasting lately are nowhere near ready yet. This is a long lived vintage and it is showing it now. Perhaps they should have gone with a '75 Petrus, a superior bottle and drinking now. 3. You are blaspheming the wine. Yeah I said blaspheming. It is honestly a shame that rich, stupid people are going to deny the rest of us quite a few bottles of Petrus all in the name of showing off. If you are going to rub it in our faces at least have the common decency to drink the thing with a fantastic, overly rich, hedonistic french meal that we also can't afford. Let us know your thoughts on the burger, the wine, or the post. After watching that ad a dozen times to try and get a fix on the bottle, I am now jonesing for a mean burger. 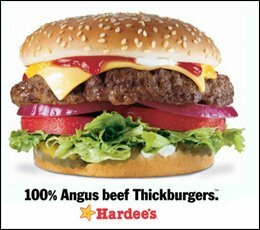 Damn that Hardee's.